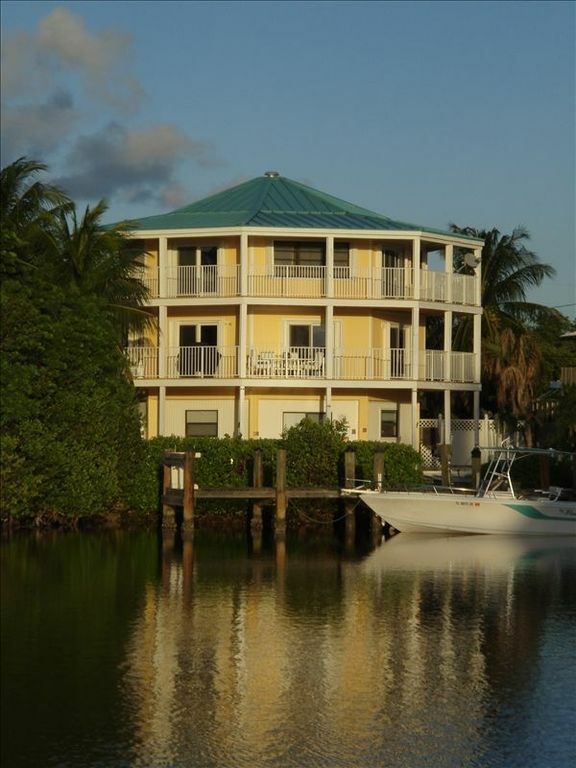 Home sits on a large (200 by 800 yard) quiet lagoon on the Gulf side. We have all KING SIZED BEDS, plus a trundle with 2 twins. There are 2 MASTER BEDROOMS, one upstairs and one newly remodeled with King bed and new large custom shower at Poolside. Note this is a separate entry with no inside stairs to living level. There is also a new King bed upstairs in the guest room with its own full bath. The new 55" High Def TV comes with 200+ Satellite channels and also AT&T Uverse in the bedrooms. The two wrap around decks provide excellent seating for watching the amazing sunsets in the Keys. BBQ on the large gas grill, then dine alfresco on the comfy patio furniture, while possibly seeing rays jump, tarpon roll or Manatees meandering in the lagoon. The Pleasure Island Pool is 39’x16’, with built in barstools, a Waterfall and a very large Spa with mood lighting. There are plenty of comfy chairs and lounges to relax and get the tan you crave. The 60’ dock has water and power, as well as a fish cleaning station. A bait freezer is provided for your convenience. An outdoor shower will cool you off after a hot day of fishing. Our resident fish, commonly seen from the dock, include Tarpon and Mangrove Snapper. We love fishing, diving, boating and travel. We fell in love with this home the minute we walked in. The huge lagoon is full of life! We love fishing and diving in Marathon. Our home is open airy and spacious. The pool and spa are inviting and relaxing. What can i say about this place..... it was awesome. Cindy and Tommy were the BEST owners/hosts. We had a slight issue with the dishwasher, they immediately came over to help us out and fixed it asap! The house is beautiful, the view is stunning and the pool is great. We had 8 people with us, me and my husband, my daughter and her fiance, my son and 3 of his friends. there was plenty of room for us all. the boys had the lowest level room by the pool and my daughter had the bedroom upstairs. We got the master and it was awesome. we had a great time and if we come down again, we will definitely stay there! Thank you Cindy for everything! 3 couples rented the house for a week in early March. We found the house to be very comfortable for 6 people. The kitchen is huge and could easily fit 6 people in it at the same time without bumping into each other. It's the only house we've rented that had a full supply of spices and condiments. All rooms were nicely and comfortably furnished. The living room had a couple of conversation areas. All the beds were large and comfortable. Bathrooms were very spacious. Only one set of towels per bathroom. Washer/dryer provided, bring your own laundry soap. We used the great pool and hot tub a lot especially due to the heat. We would suggest a little more shade on the pool side. We were 'chasing the shade' all afternoon. There are no umbrellas or shade provided. Due to the intense sun and heat, we were forced to eat all meals inside although there were areas provided outside without shade. Cindy had someone meet us upon arrival to explain where everything was and how to work the tv, etc. Jim was very easy to work with and offered some dining suggestions. There are a lot of stairs, which we knew before getting there. But anyone with knee problems should make note. We highly recommend this home. Cindy and Tom made us feel so welcome. The house itself is beautiful, not to mention the pool and dock. We will be back next year for sure ! We highly recommend this house. You will not be disappointed. Pool was great as well as the spa that we used every day. The kids really loved the agunahs walking around the back yard. Cindy was very helpful with any questions we had. We could not think of anything to complain about. Plenty of room in the great big kitchen and house is perfectly located between miami and Key West. The adult children loved having their own bedroom and bath disconnected from the rest of the house and next to the pool. The only challenge we had with the house were the motion detector spotlights all around the deck that shined on the pool; being blasted with light every time someone moved to het a beer was horrible and unnecessary.